Sangeeta International was established in 1972, in New Delhi India with the vision to encourage and elevate the traditional handmade cotton canvas luxury tent. We continuously aspire to showcase our superior and unmatched craftsmanship and quality of work in the global market, specially UK, USA, Europe & Australia. We at Sangeeta International, one of the top tent manufacturers in India, know the art of creating Magic under Canvas for your special events, luxury parties & wedding. Each luxury tent made by our luxury tents manufacturers are of Superior quality cotton canvas. We at Sangeeta International, one of the leading tent manufacturers in India, produce and export our magnificent cotton canvas luxury tent to various Medieval Groups, for camping in burning man festival, deserts, safari, private party, beaches, luxury resorts, army, military, relief and the list is unending. Our expert Creative & Designers Team and manufacturers create splendid hand embroidery and exclusively printed interiors for your Indian Wedding Tent, party, luxury events, ceremony & rituals. Our luxury tents manufacturers also undertake designing and development of Customized luxury Tent in our own Tent Factory in New Delhi, India. You are sure to find an elegant Pergola, luxury Tent and more Raj Tents with us that entirely befits your requirements and suits your budget as well. Our magnificent luxury Tents are sure to charm your guests and make your party a talk of the town. We, the best tent manufacturers in India, make pole tents for your outdoor garden party and luxury frame tents for indoor party. The best manufacturers in India working with us use the best quality Canvas to make hand crafted, luxury tent and traditional tents. 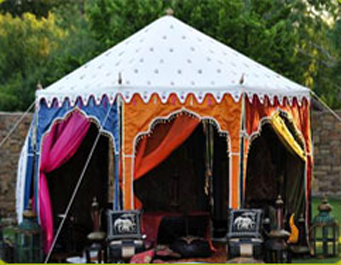 Sangeeta International is the Export division of Namdhari Tent Manufacturers. This is an ISO 9001 :2008 Tent company. We keep updating our Product Line, with New Designs and Improved Structures, to cater to the needs of our clients. We offer beautiful Patterns and Colors to give a Rich Interior to your Tent. Colors & Patterns can be chosen by You. Indian Gods & Goddess Idols and fabric lamps were supplied by us at an Indian themed Festival in The Netherlands, almost 20,000 guests admired. A beautiful Kid’s Tent has been designed by us for a Baby’s cradle. More pictures are on the Children’s section. A splendid Marquee, with a rich Star & Mirror interior was supplied to our buyer in the UK, we have more pictures of it in the Marquee section !